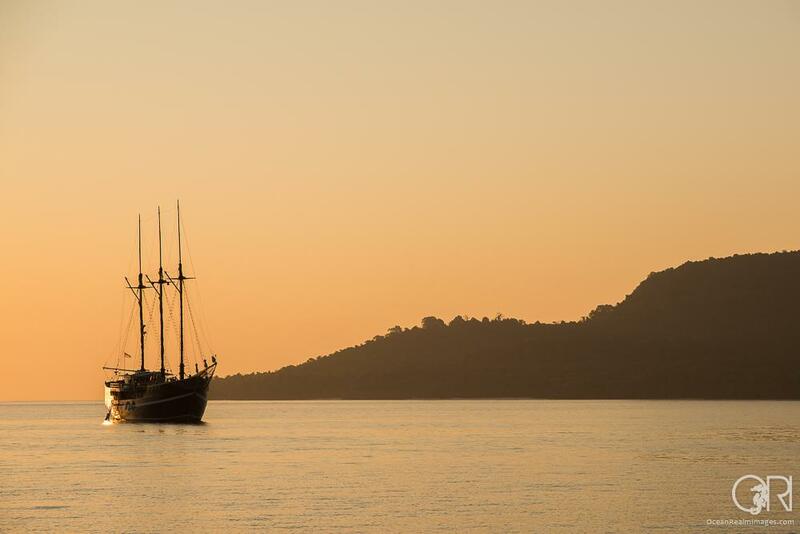 We have just returned from the inaugural ‘Our Beloved Seas’ trip aboard the beautiful, Dewi Nusantara. We were pleased to be joined by so many old friends on this first trip, as well as welcoming several new faces too. Our eleven night itinerary started in Maumere on the Indonesian island of Flores and took us to dive sites on the islands of Kawula, Pantar and Alor, as well as further east to the rarely visited island of Wetar. Wendy Brown and myself make up ‘Our Beloved Seas’ and together lead scuba diving expeditions for divers interested in learning more about marine life and exploring some of the best dives the oceans have to offer. Wendy’s exhaustive knowledge of Indonesia’s dive sites gets us to the best places to explore the region’s diversity and I give marine life talks so people can learn and appreciate fully the amazing creatures and ecosystems we encounter. We are both passionate about conserving the world’s seas and for each of our trips we donate a percentage of the proceeds to a different conservation organisation, which we feel are doing great work. For this trip we chose to support the Save our Seas Foundation, who do fantastic work through the funding of conservation, education and research projects around the world. In the Coral Triangle region they fund projects that work to reduce destructive fishing techniques, as well as the protection of marine megafauna such as sharks, turtles and mantas. More specifically, around Indonesia they have a major project conserving and researching the magnificent manta ray and the fisheries targeting them in Bali, Komodo and Raja Ampat. Definitely a worthy cause in our eyes! 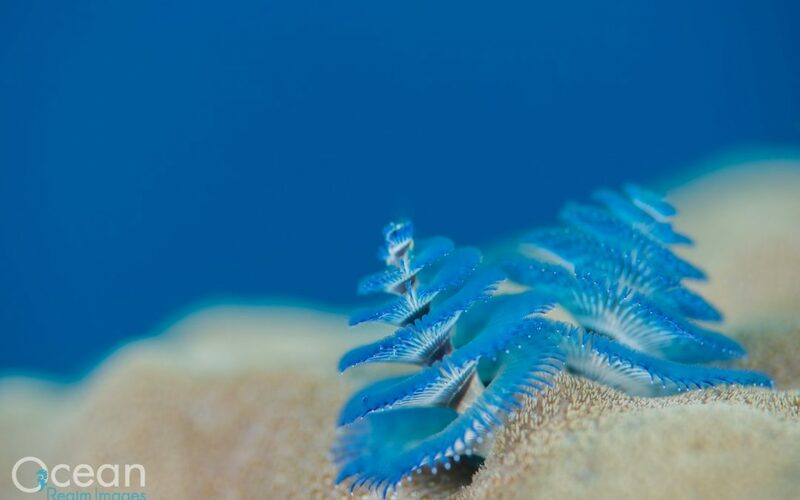 If you’re interested learning more about them, you can visit www.SaveOurSeas.com and you can also support them through their ‘donate‘ page. During the trip, I presented marine life lectures every other day (with a few extra-curricula ones in between). The talks started with ‘The Marine Life of Alor’, focusing on the special creatures we hoped to see, including the two Rhinopias species the Paddle-flap (R. eschmeyeri) and weedy scorpionfish (R. frondosa) and their identification. The weedy scorpionfish is commonly misidentified as the lacy species (R. aphanes), so I wanted to help our guests with their correct identification for when we inevitably found some on the trip. You can read my blog about Rhinopias identification here if you need a reminder! 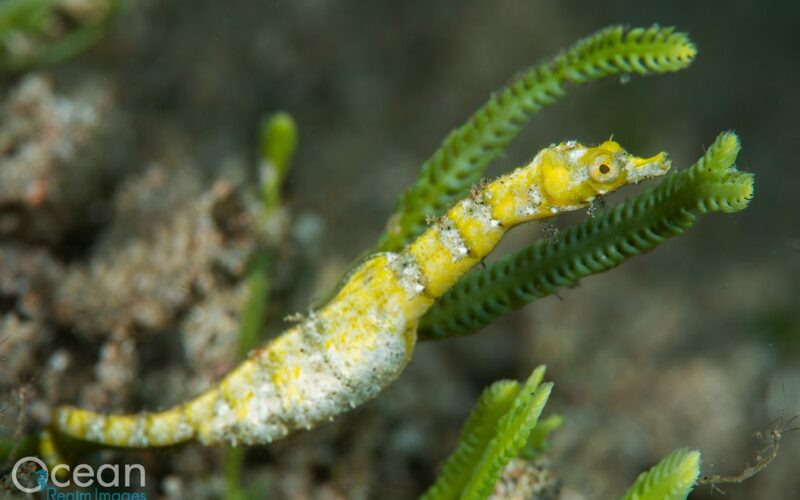 What I enjoy so much about diving around Alor and the eastern Lesser Sunda Islands, is the real surprises you come across on a day-to-day basis. Whilst amazing and rare as hen’s teeth, Rhinopias aren’t even considered a surprise in these parts. You can almost guarantee these rare fish around Alor, indeed five were spotted on this trip alone. There were several new behaviours and species for me on this trip. The new behaviour I was most excited about was the parental care exhibited by the spiny chromis (Acanthochromis polyacanthurus) to its fry. I had never put two and two together when I’d seen little balls of fry around the reef, but now I’ve identified what I’m seeing and these doting parents are everywhere. There are only three species of damselfishes that care for their young in this manner, which cuts out their pelagic life history stage. So it’s a treat to see this in action. There were two exciting new fish for me on this trip too: the harlequin grouper (Cephalopholis polleni), which I spotted on a dive in northern Pantar, and a wobbegong shark in Alor, which was particularly exciting. I have seen the tasselled wobbegong (Eucrossorhinus dasypogon) in Raja Ampat many times, but the shark we saw in Alor clearly belonged to the closely related genus Orectolobus. Alor is well outside the known geographic range of any described wobbegong shark. The thinline wobegong (Orectolobus leptolineatus) is known as far east as Lombok and the northern wobbegong’s (Orectolobus wardi) only Indonesian record is from the Aru Islands to the west. Fortuitously, several of my friends are experts on wobbegong sharks, so I hope to be able to get some more information on the identification of this unusual carpet shark over the coming weeks, so stay tuned. During this trip we returned to Wetar Island, which is a remote and rarely visited island in the very eastern Lesser Sundas. I actually dived the very same site in April when I was aboard Dewi with Paul Humann, Ned and Anna DeLoach. During the dive, I passed a rock where I remember having seen my first ever juvenile Cross’s damsel (Neoglyphidodon crossi), a species which is known only from the eastern half of Indonesia. I though ‘why not’ and had a look to see if it was still there. Sure enough there it was, slightly larger and having lost some of the bright orange and blue that had attracted my attention three month before. I was really chuffed to have seen it again and to see how it had developed. We also shared several special experiences above water as well as below. In Wetar we visited a couple of small villages and I met my first ever crocodile whisperer (I don’t imagine many people can make such a claim!). The villagers were so friendly and welcoming to us and happily showed us around their schools and churches, although sadly no crocs were sighted. Returning to Dewi after one village adventure, we all convened on the bow to watch an absolutely stunning sunset. Suddenly someone spotted something breaking the surface a hundred metres away, which turned out to be a mother humpback whale with her calf! It was truly a moment I will never forget. The pair repeatedly and serenely broke the surface to breathe, the sound of which was clearly carried to us in the calm air. The surface water was on fire with the reflection of the sunset, making an outstanding and memorable moment. Sadly, the final day of the trip was quickly upon, which meant it was time for our fun photo competition. It’s just a bit of fun so we can share images taken from the trip. However, the popular vote decided the grand prize winner. The crowd’s cheers helped us whittle the forty images down to three, with David taking the grand prize with his displaying flasher wrasse. Dena and Katsuko were close runners up with their jawfish with eggs and seahare shots respectively. The evening was perfectly rounded off with an amazing video presentation of muck dive macro critters by Mary Jane. We’d also been treated to stunning megafauna videos from George, of whale sharks in Cenderawasih Bay and bull sharks in Fiji earlier in the week, so we’d seen plenty of National Geographic quality footage from just two of our guests during the week! Hopefully they’ll have a compilation to share from this trip sometime! To see some of my images from the trip, please follow this link to my Alor and Wetar | August 2014 album. A few days after another fantastic trip as resident naturalist on the stunning Dewi Nusantara, I am ruminating over our adventures from a somewhat contrasting setting in England’s rolling Cotswold Hills. Despite the Cotswold’s inherent splendour, being designated nationally as an Area of Outstanding Natural Beauty, the untouched wilderness we explored aboard Dewi around Alor is incomparable. England has been manipulated and moulded by man for thousands of years, but the forested islands and untouched reefs of Alor remain largely as they always have been. Indeed, during our trip we even witnessed active volcanoes creating fresh new lands for nature to claim afresh. This trip, the second hosted by well-known authors of the fish ID and behaviour books Ned and Anna DeLoach and Paul Humann, began and ended in Maumere on the island of Flores. From here we explored the islands of Alor, Pantar and Lembata. This area hasn’t been explored to such an extent as others in Indonesia, but it experiences some unique oceanographic conditions that make it very different from all other parts of the world. On our previous trip which took us across the Banda Sea, we had chance to stop briefly in Alor and I found a single male Humann’s fairy wrasse, Cirrhilabrus humanni. Sadly, it was at the end of the dive and only Anna got chance to see and film it (have a look at the first ever video taken of this species when she first discovered it in 2010, click this link). I hoped to find more on this trip and share this rare and beautiful fish with more people. Luckily, I have managed to develop the eye for Humanni, and my brain now knows how to pick them out from a crowd of very similarly coloured Javan fairy wrasses. Over the course of the trip, we found several males and their hareems at one site in Alor, only a couple of miles from the place Anna first discovered the species. After a couple of days in the Pantar Strait between Alor and Pantar Islands we headed south to one of my favourite spots, Beangabang Bay. This bay never disappoints and is different every time, concealing many treasures for the observant to find (luckily, we had a gaggle of eagle-eyed guides on hand to fulfil this roll). There is an outstanding muck dive on the black sand in front of the village, but on this visit my most memorable dive was on the nearby reefs. On one particularly large bommie, Yann called us over to show us a very striking fish. on its genes to future generations. Alor is renowned for being one of the best places in the world to see the wonderful Rhinopias scorpionfish. The ‘Holy Grail of the Underwater Photographer’ is rare at best and often found very deep, but in Alor they can be common and shallow. On the first trip we saw three individuals during our brief visit to the region, but with more time on this trip we saw a total of five: three red and two yellow weedy. There is always considerable confusion regarding the identification of Rhinopias species. People commonly want to call particularly filamentous examples of the weedy species (Rhinopias frondosa) the lacy species (Rhinopias aphanes). Their specific identification, however, is largely a matter of geography. The lacy is found only in (and endemic to) the Coral Sea region including the Great Barrier Reef, Papua New Guinea and the Solomon Islands. The weedy is much wider ranging and found all the way from east Africa to the Pacific islands. As such, you can come across weedies in PNG, but not lacies in Indonesia. Apart from geography you can also look at the pattern. Roughly speaking, weedies always have a pattern containing circles, whereas lacies have lines. I am so very passionate about the identification of Rhinopias that I even wrote a blog about it, so you can read more about Rhinopias ID by clicking this link. Again this trip we were lucky enough to witness the volcano of Kumba erupting. It had always been an ambition of mine to see an active volcano and with Kumba exploding every ten to fifteen minutes I certainly got my chance. Dewi floated a safe distance from the volcano as smoke billowed from the caldera and occasional molten rocks and lava were flung aloft and rolled down the scree slope all the way to the ocean. The sound from both the eruptions and the vaporised water as rocks hit the cold sea could easily be heard, and felt, from our safe haven aboard Dewi. Thanks to the eagle eyes of the dive team, Andre, Ben, Risko and Yann as well as Cruise Director, Wendy, we saw many underwater treasures on the trip. I’m always sad to leave Dewi Nusantara and her fantastic crew, but this time I know I’ll be returning in only a few months. I will be back on Dewi for two charters in August/September this year, that I am co-hosting with Wendy under the banner ‘Our Beloved Sea’. I have known Wendy for almost ten years and it is our shared love of Indonesia’s amazing marine life and a sense of exploration that made us decide to lead expeditions together. Our trips will have a similar, but slightly different, itinerary to this one. Both will include the very best of Alor, Pantar and Lembata as well as the volcano of Kumba, but the first will also include the rarely visited island of Wetar and the second will include the Wakatobi chain. On the first trip we have a deluxe cabin available and, due to a recent cancellation, the Master Cabin has also recently become available. This rarely happens and is likely to be snapped up quickly so let us know as quickly as possible if you’d like join us in the ultimate lap of luxury! You can read much more about these trips, and download a flyer, on my expeditions page click this link. Images | I have created a gallery of images from the trip, which you can view by following this link. Also, click through to read my report from the first trip as well as images from it. To keep up to date with my Expeditions, Images and Publications you can follow me on facebook, twitter or sign up for blog updates by entering your email address in the box just to the right. After almost a year away from the beautiful Dewi Nusantara, I am really excited to be back for another two trips sailing the megadiverse Indonesian seas as resident naturalist. I am even more excited as the trips are being hosted by Ned & Anna DeLoach and Paul Humann, the well-known authors of many fish ID and behaviour books and the founders of REEF (Reef Environmental Education Foundation). I have really enjoyed the buzz surrounding the dives on this trip, with one or all of our eminent guests coming up from virtually every dive buzzing about a creature or behaviour they haven’t seen before. It is fantastic to see such passion, even after tens of thousands of cumulative dives, and it is certainly infectious. Myself, Paul and Ned have given talks in the evenings and it has been an amazing experience to learn from these extraordinarily experienced natural historians, their insight into the reefs’ goings on is outstanding. This trip, the first of two, has taken us from Ambon to the island of Flores, just east of Komodo. This is quite some distance to cover in 14 days (around 850 miles or almost 1400 kilometres), but it has given us rare access to some very remote, fascinating and historic locations across the Banda Sea. We followed an arc of tiny islets on the eastern side of the sea visiting the volcanic islands of Banda and Manuk, the coral atoll of Dusborgh and the limestone islands of Terbang and Romang. The Banda islands are steeped in history, being the centre of the global nutmeg trade in the 1800’s. We enjoyed a couple of days diving in the area, packed with interesting critters, as well as a tour of the historic fort and town before heading further south. Manuk was our next stop and like its better-known cousin, Gunung Api, is renowned for its large population of sea kraits. Sea kraits aren’t quite as well adapted to life in the oceans as the true sea snakes, one of which we saw later in the trip in Maumere harbour. Sea snakes, among other adaptations for life in the ocean, give birth to live young at sea and have nostril valves to keep the water out. Sea kraits on the other hand are more akin to terrestrial snakes and are more tightly tied to the land; most significantly they must come ashore to lay their eggs. As well as the kraits, a highlight for all of us at Manuk, and the next couple of islands on our journey, was a very rare juvenile fish indeed. After the first dive at Manuk several of us surfaced asking the same question: “What was that pink and red fish?” It turns out we had all been seeing the juvenile colour form of the Masked grouper (Gracilia albomarginata). Surprisingly, despite having seen the adult many times, this was the first time any of us had come across the striking juvenile. Over the next couple of days as we sailed southwards, we saw juveniles ranging in size from tiny (very cute) individuals to larger intermediate or transitional forms. The adults were all over the reef, but it was the juveniles that became an utter obsession, for me at least. After hopping our way along these relatively small islands we met the eastern end of the Nusa Tenggara chain at Wetar Island. Here, we fitted in a day of diving on the north west corner of the island around Reong Island, where I found other juvenile fishes that I hadn’t seen before, including the stunning Cross’s damsel, several hogfishes and several of the green, black and white striped bird wrasse babies. Despite having crossed the Banda Sea, we still had another long journey to reach the Pantar straight between the islands of Alor and Pantar, which would be the location of our next day’s diving. We were all very excited about our first dive in this area, as we would be diving the site that, on her last trip to the area several years previously, Anna had discovered a brand new species of fairy wrasse. In 2012, the stunning fish was named in honour of Paul Humann, who was also aboard and out in search of his namesake. We were briefed by Anna about the habitat in which she had found the fish and off we went to search for it. There was a roaring current around the site, but a small area was protected and full of fairy and flasher although sadly Cirrhilabrus humanni was not among them. It was, however, a great moment for photographing yellowfin and filamented flashers, as well as Solor, Javanese and the yellow back form of Lubbock’s fairy wrasses. We subsequently decided to move across the straight for a few dives in Kalabahi Bay, where we dived Mucky Mosque. This site is always productive with unusual and unique critters. Again, it did not disappoint and one of our guests, Brad, kindly found a stunning red paddleflap scorpionfish (Rhinopias eschmeyeri) at the site. Very excitingly, on our last afternoon dive, I spotted a fish that I didn’t recognise. I managed a few images and followed it round for ten minutes or so to gather clues as to its identification. I still wasn’t sure, so I found Anna and showed her my picture. It was indeed the Humann’s fairy wrasse that we’d all been looking for! She managed to get some video of the lone male, which is some of the only footage ever to be captured of this rare fish. Over the next couple of days we continued our journey along the north coast of the Nusa Tenggara island chain, which had some excellent muck dive offerings. Again, Yann found us a Rhinopias, a lovely red weedy, and we saw six giant frogfishes, plus a svelte male velvet ghost pipefish. Our last hurrah, before heading to our final destination of Maumere on the island of Flores, was to visit the active volcano of Kumba. Indonesia is extremely geologically active, straddling several tectonic plates and as a result has several active volcanoes. Kumba erupts every fifteen minutes or so and is especially breath-taking at night when plumes of glowing red lava spew from the caldera and scarlet red rocks roll down the scree slope. This was certainly a sight not to be missed and a highlight of the trip. The next day we woke in Maumere Bay and fitted in a dive at Pomana Kecil Island with 24 hours to spare before our guests would disembark the next morning. Many of our guests were doing fish counts and ID throughout the trip for REEF, and Pomana actually provided the highest fish count of any site we’d dived on the whole trip. We have another exciting trip planned with Ned, Anna and Paul, which will leave Maumere in a couple of days. We will be focused on the greater Alor region and have our sights set on some very exciting areas and animals, as you’d expect from this group! Stay tuned for my next blog update, but in the meantime you can view some of my images from the trip by following this link. Finally, feel free to follow my page Richard Smith – Ocean Realm Images on Facebook and my twitter feed for updates from the next trip as it happens! We are already more than a quarter of the way through 2014…. how did that happen?! It’s been a busy few months here at Ocean Realm Images with group trips to Socorro Island, Mexico and the Philippines, plenty of published articles and exciting new ventures in TV and film. Socorro :: January 2014 | The year kicked off to a great start in January with my group trip to Socorro Island, Mexico aboard Solmar V. We spent eight days diving this remote island group 250 miles from the Mexican mainland. It truly lived up to the name ‘Manta Capital of the World’, but there were many more creatures than just mantas with amazing shark, dolphin and interesting endemic fish encounters. I’ve posted some images from the trip here. Philippines :: March 2014 | I have just finished an amazing trip, with a brilliant group of people to the Philippines. Sixteen of us spent a week at the remote Tubbataha Reef in the middle of the Sulu Sea, followed by 5-8 days (some people chose to extend) at Dumaguete Resort. Dumaguete offered a perfect contrast to the pristine reefs of Tubbataha, with amazing muck diving where we saw all the top wishlist critters you could possibly hope for! For shots from the trip check out my Tubbataha and Dumaguete galleries. “AMAZING! Richard is able to make scientific talks hugely entertaining. I learnt so much, and every dive after the talks I found myself on the hunt for the new critters I had just learnt all about. Brilliant!” Madeleine, Australia. Starting and ending right in front of Atlantis Resort Dumaguete, this is the perfect place to sneak in a few additional days of amazing muck at the beginning or end of your trip! I have been busy as ever writing articles for various publications around the world, four continents so far this year! I’m very excited about my new series ‘Get more from your Underwater Photography’, which started in the March Underwater Photography section of Sport Diver UK. I was also pleased to see my picture of the Japanese pygmy seahorse ‘Japapigu’ gracing the cover of DIVE magazine. I had a slight change of pace for my article in Asian Geographic, which was an oceanography piece about the Coriolis Effect and its influence on polar seas. Online, I also had the website of the week with the British Society of Underwater Photographer’s (BSOUP) and a featured album and blog for Wakatobi Dive Resort about my work on pygmy seahorses. Over the past year or so I have worked on various TV and Natural History films along side 3D timelapse specialist Robert Hollingworth. Many of these projects came to fruition at the start of this year and the tail end of last with ‘David Attenborough’s Natural History Museum Alive’ (Sky), ‘Mysteries of the Unseen World’ (National Geographic 3D Imax film) and ‘Jimmy Doherty’s: Food Prices the Shocking Truth’ (Channel 4 – UK) all showing recently. These projects took me from studios in the Cotswolds to chicken hatcheries in Holland and allowed me unprecedented access to explore the deserted halls of London’s Natural History Museum through the dead of night (which, I’m not going to lie, was absolutely terrifying). There will be lots of adventures over the coming months. I am about to head to Indonesia where I will be joining fish gurus Paul Humann, Ned and Anna DeLoach on their two trips aboard Dewi Nusantara. We start in Ambon and will sail through the Banda Sea to explore the southern islands of Flores, Alor and Wetar. It will be these islands that we visit during my own trips in August, so we’ll know all the best places to take you! If you’d like to get more up to date info from myself and my adventures over the coming months, head over to Facebook and ‘Like’ my page Richard Smith – Ocean Realm Images! It has been a very busy few months since my last blog update so I thought a last quarter review style blog would be the easiest way to cover everything. Since my last update I have led a group trip to Fiji, dived in Nelson Bay, Australia with let’s Go Adventures and in Lembeh Strait, Indonesia and attended the world’s largest dive trade show in Orlando, as well as having numerous publications around the world. I realised recently that my first published piece was over six years ago. How time flies! I still regularly write for Australasia’s Sport Diving magazine, but I’m now also writing for many other publications. Over the past few months since my last update, I have published eleven articles in eight different publications (listed below, with links where applicable). I have many features coming in the New Year too, including a new series starting in Sport Diver UK’s Underwater Photography section, which I’m very excited about, so keep your eyes peeled for that one. In the meantime, you can follow the various links below to read some of my publications from the past couple of months. I have recently put several new trips on the books, taking us all the way through to 2016! I’ll be visiting some of my favourite areas doing some fantastic diving, whilst also learning about the creatures we’re seeing, so why not join me?! Finally, if you’d like to get more up to date info from me and my adventures I suggest you head over to Facebook and ‘Like’ my page Richard Smith – Ocean Realm Images. That way you’ll see lots of lovely photos and stay up to date on trips and publications in real time! I am very excited to announce that I will be joining forces with dive guide extraordinaire, Wendy Brown, to lead a couple of trips aboard the stunning Dewi Nusantara next year. DOWLOAD THE TRIP FLYER AT THE BOTTOM OF THIS PAGE! As subscribers to my blogs will know, I have spent a lot of time aboard Dewi exploring some of Indonesia’s best diving areas. Wendy has been cruise director there since her maiden voyage five years ago, but has now taken the decision to scale back her time at sea. We decided to do these special charters in a couple of areas we really wanted to get back to, giving us the opportunity to tailor the trip for our guests and include a nice mix of exploration, revisiting our favourite spots and share the best these areas have to offer. The eastern isles of the Nusa Tenggara archi­pelago are rarely visited; yet host many amazing dives. 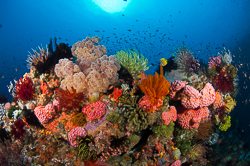 A fantastic mix of reef and muck dives offer something for everyone at the heart of the Coral Triangle. Here, stunning topside scenery meets unique underwater environments found no­where else, such as the famed ‘Clown Valley’ where anemones smother the entire reef. The outstanding muck dives of Alor are some of the most reliable for finding the rare Rhinopias scorpionfish. This trip offers two rich and distinct areas: the muck sites and unique reefs of Flores and Alor, followed by the bustling coral expanses of the Wakatobi region in Southeast Sulawesi. We will visit many of the best areas in Alor, before sailing northwards to the Wakatobi region. During both trips, as we enjoy our evening meal safely aboard Dewi, we will have the opportunity to watch Kumba volcano whilst it erupts approximately every 20 minutes. In the Wakatobi chain we will dive sites, almost never visited by local operators thick with colourful soft and hard corals. A bit about Wendy…… Wendy Brown was born and raised in Sri Lanka, swimming before she learnt to walk. She has been diving for 30 years and has spent the last 10 working in Indonesia sharing her passion and enthusiasm for its wealth of marine life. As one of Indonesia’s most experienced Cruise Directors, she is renowned for striving to deliver the very best customer care, making every guest’s trip unforgettable. 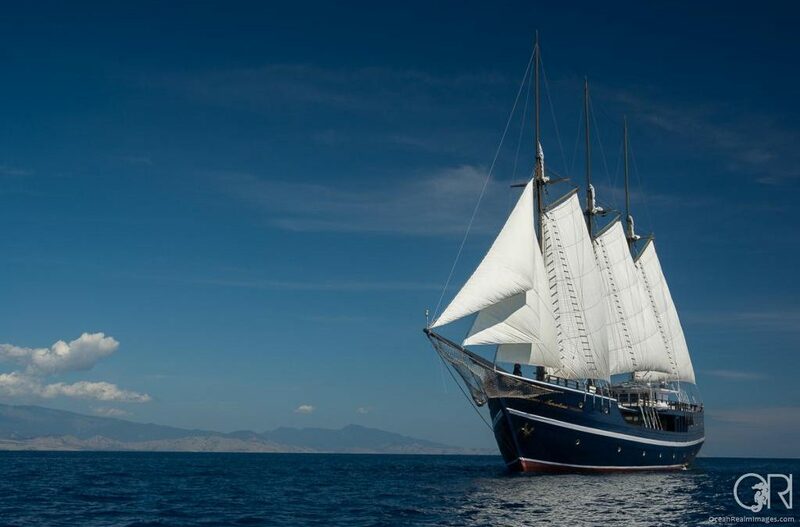 A bit about Dewi…..Dewi Nusantara is an elegant and genuinely spacious 5 star vessel, sailing to the faraway corners of the Indonesian archipelago. At 57 meters, this three-mast topsail schooner moves with a grace and stability that only larger sailing vessels can offer. The ‘Goddess of the Archipelago’ was designed to be totally independent for long periods at sea, while offering unparalleled comfort. Eight spacious, air-conditioned staterooms can be adapted to twin or double occupancy, each with an en-suite bathroom. The stunning Master Suite is the size of a large hotel room. Four dive masters complement her discreet and attentive Indonesian crew of eighteen. The name Dewi Nu­santara has become synonymous with the ulti­mate live-aboard diving experience in Indonesia. Why dive with us?…….With over 20 years experience and thousands of dives in Indonesia between them, Wendy and Richard are some of the best qualified to share the country’s rich and varied marine life. This wealth of knowledge allows them to tailor their trips, pro­viding well-planned, safe, exciting and unique expeditions, all in a relaxed ‘friends among friends’ atmosphere. They will be on hand to teach and mentor throughout the trip. Be it fish identification, marine biology or photographic tips. Together we will discover new and unexplored dive sites, as well as revisiting firm favourites. We will be hunting for exciting critters, experiencing the cacophony of jam-packed reefs whilst also learning about them from Richard’s evening talks. Richard will be conducting a series of evening lectures during the cruise, exploring the fascinating species, behaviours and ecosystems we encounter. Both Wendy and Richard assert that the more you learn about the reef, the more you will get from your diving experience. Not to mention improving your photography through knowledge of the subjects and where to find them. Get more from your diving by allowing us to share Our Beloved Sea…. Bookings…. If you decide you’d like to join us, a 25% deposit will hold your spot. In addition to the trip itself, we can also arrange domestic flights, hotel stays before or after the trip, transfers, fast track visa on arrival (Bali only) and any pre/post tour extension that might take your fancy. For more detailed information about Dewi Nusantara you can check out their website here, or download the ship handbook here.